Almost all articles on E-Commerce in India talk about COD (Cash on Delivery) and how it has impacted sales or margins, depending on whether the story is on the increasing number of online buyers in India or losses per order respectively. So is it good or bad? Will COD be the boon or bane for Indian E-Commerce? Well lets face it. Cash is the primary means of transaction in India - online or offline. Except in some metros like Mumbai or Bangalore where you can see the salaried class using their credit cards for payments big or small, for most people in these cities as well as others, the preferred form of payment is still Cash irrespective of the size of the payment. 1) The cash economy of this country. Most small and medium business in India do a lot of their transactions in cash to avoid taxes and they would rather use cash for their daily personal transactions also, be it a a bill payment at a restaurant or a retail purchase. A credit card would mean transactions can be tracked and they would not want to do that. 2) No incentive for credit card usage, whereas in a lot of instances when you pay cash upfront you get an across the counter discount. 3) The negative image of credit cards in this country due to media stories on credit card frauds etc.... You don't read as many stories of people getting robbed of their cash as those stories are not as sale-able. Another reason could be that Credit is a bad word among the large Indian middle class and they would rather not have a credit card, lest they fall into the revolving credit loop and commit a sin of having to live in credit. However we have multiple times more Debit Cards (than credit cards) in this country but the use of debit cards is also limited and average transaction per debit card is lower in India than credit cards. Some people have also said that COD is relevant in the Indian E-Commerce context as we like to see the product before we purchase. That argument is debatable, primarily because a person who purchases online does it for the convenience or choice or lower price and for this consumer, payment by COD or online using a Credit or Debit card should not make much of a difference - specially so in the case where they are purchasing a branded product from a well known retailer. Also most Indian retailers and etailers have warmed up to the idea of allowing returns of a product if the customer is not happy with the purchase. So are we saying that COD is here to stay and even though it effects the bottom line of the etailer they should continue with it? Its just that most of our E-Commerce players still need to get their act together in terms of their product catalog, choice, price, ease of use of their websites, delivery and Customer service. There are too many players with little or no product or service differentiation and they are suffering more because of these reasons. And COD - offered just because everyone else is - is only worsening their woes.They first need to correct the basic issues & then work towards offering those payment options that make sense for the consumer..
1) An industry/government initiative to push the adoption of Credit & Debit Cards and explain the advantages of using the same both online and offline and also incentivize the same. 2) A concentrated effort by the E-Commerce players to offer COD as a last option & only where it's required and incentivize other payment options. 1) Assuming that etailers are offering COD to lure the rural customer who may not have access to Credit or Debit cards - they could begin by offering the option only in select cities and / or on select products or order size. 3) For unique and / or new product launched offer only the option for Credit or Debit Card payments and not COD. 4) Tie up with Banks and Companies such as Visa or Master to offer more incentive for using their credit or debit Cards. This could be cash back or higher loyalty points or even a flat discount or better loyalty points on the card. 5) Tie up with other merchants online and offline to offer incentives to consumers who pay using their Credit or Debit cards ranging from cross sell to discounts. .... and am sure there are many other already being implemented or thought of. It would be good to however reiterate here that the larger problem with E-Commerce in India right now is not really COD. It's our sellers not really understanding our buyers & not offering unmatched buying experience to increase customer confidence, loyalty and encourage repeat buying. Those who understand that will be around for a long time to come while others will cease to exist. Can we just let our e-Commerce companies be? 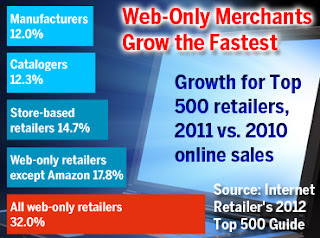 The interest in Indian e-Commerce and e-Retail is growing day by day. And that's not only fuelled by the VC investments in the space. Currently there is a raging debate going on online on the recent cover story in Forbes India on "FlipCart and FlipCart CEO's letter to the editor". Today's Mint has an interesting article on Indian e-Commerce scenario : "India’s e-commerce story at risk of losing its sheen." Let me clarify the two stories are not connected but the reason I mentioned these is because they both have to do with the Indian e-Commerce and e-Retail story. No because as we all know e-Retail is here to stay - with the inherent advantages of e-Retail as well as growing internet penetration and the sheer number of youth population who are always connected on their smart phones, tablets and laptops, - growth is inevitable. Yes because profitability and loyal customer base are not made in a day and not many of the current lot will survive this tough period from start to profitability. As I had mentioned in my blog "eRetail in India and the focus we need" the Customer is the key here. FlipCart seems to have done a great job so far if you look at what most of their customers have to say and that I think matters most from today's perspective and frankly I don't think we can say that for a lot of other e-Retail sites we have out there. Lets also understand the fact that setting up and running an e-Retail business in India is tough. Right from experienced manpower to warehousing and delivery, everything is difficult to come by and many a thing has to be built from scratch. Unlike the Europe and US where you have FedEx and the likes to take care of product delivery and returns, in India we do not have such fine tuned ready to sync services. Product Returns is something taken for granted in the US and Europe where as in India most of the offline retail chains too don't have easy return policies. While online payment is the preferred mechanism in most countries, in India COD still rules in a lot of towns and cities. Each one of these needs to be tackled and that takes time & money. So as our e-Retailer's build from scratch, learn the ropes and burn money as they do, those who know their target audience, build a great experience for them, and are able to carve a niche for themselves in their minds will gain the major share of their customers wallets and will survive. The me too's and the one's who focus on everything for everybody at whatever cost will find it more and more tough as customers and markets mature. And they are learning that too. Some e-Retailers have opted out of the game while they rethink their strategies while some are re-inventing themselves as we speak. Overall, for India, it may be too early to predict who will survive and who will not and why. The destinies of our e-Retail and e-Commerce companies will be decided when e-Life becomes a way of Life in our country and while that is still happening let's not try and pull those who are trying, down. We all know it. Its common sense. However when working on redoing our current website or when making a new one we tend to forget a few key points as we are all busy - 'doing'. So just to re iterate here are those few points, that I think if we keep in mind, we will have our basics right. Keep all pages simple & Clutter free. Easy to read and easy to move on to other relevant pages within the site. Make sure the home page has least distractions. Focus your core offerings on the home page. Too much happening on the home page tends to distract the visitor. They should know how they can benefit from what you have to offer and that you are trustworthy. Whatever product/s or services you are offering - remember the visitor is interested in what is in it for him or her. So tell them what's in it for them - "Find the cell phone most suited for you Here" With a search option, is better than saying - "All models & makes of cell phones available here", and providing a laundry list. Remember the Internet is an interactive medium, and though your ad may have got the visitor to your page - it is the visitor who chose to click on your ad and come there. Give them something to do. So a search based on some key parameters is better than just a listing that scrolls on and on from A to Z. If listing is important or after the search when you show listing give the visitor options to narrow the results or view them differently. Make sure your pages starting from the home page load fast, very fast. Else the person can just click away. Remember the fingers are itching to click and move ahead while the visitor is Sitting waiting for a page to load. Options on the internet are many and if your page takes time to load - away they go. Keep the navigation simple and easy - If they can't get to it in 3 clicks it's not worth having it there. Make sure the primary and secondary navigation are always in the same place on every page. Don't have different navigation structure on different areas on the same site. So if primary is on the top and secondary on the left then keep it that way all cross the site. If the person is coming from an ad or an email then take them directly to what the offering was - not to the category page and then the sub category page and then the product page. If the message in the email says great offer on 'XYZ cologne' then make sure a click on that takes the person to the relevant page with the offer on the 'XYZ cologne' and the visitor is able to immediately buy from there itself. Make content - text, images and videos - from the visitors perspective. Keep the text short but conversational. Use images and videos to show what your are offering or saying. Long monologues that make a visitor scroll a lot are a no no. Use videos to explain what would take you multiple paragraphs to write. Use images to show instead of writing reams of descriptions. Build trust. Keep customer reviews and security icons consistent and across all relevant pages on the website. Use Live help and make it prominent and consistent on the site so that it's easy to locate and use. Its cost effective plus does a great job of confidence building, as the visitors feels there is someone live on the other side. Train your CRM team so that the visitor gets a feel that you are on the same side and not the other side. Keep the checkout process short and simple. Trying to collect too much data on the check out and making visitors fill up long forms is a sure shot way of making them run away. Same goes for registration process. Take only whats necessary and remember to tell them why its necessary (for them - their benefit) if its not apparent. Follow up after the sale. Thank the customer and give them a chance to offer feedback on the purchase or experience. Work on the feedback provided and let them know how their feedback has helped. Am sure there are many other things that I may have missed out here as I try to focus on some that I consider as most basic and important. So do feel free to write in and add things that you may have experienced. A lot of people ask me - "Hey I want to make a website for my business - How do I go about doing that?" and my first response is - "Why do you want a website?" The answers mostly is - "oh but in today's times isn't is necessary to have one?" OR even "People ask what is your website address and I need to give them one", OR "Everyone I know has one so I should have one too." OR sometimes few people say - "I want to increase my business". Well it's great to want to have a website. However what is equally important is to know why. Answering the question why helps define the purpose / end result desired, and the target audience, which in turn helps decide the features, technology and other issues involved in starting to plan building a website. Just as you didn't start manufacturing Razor blades, or selling packaged food because one fine day you just wanted to, similarly you shouldn't make a website just because it's necessary to have one. I meet a lot of people who have build websites, just because someone told them to or one fine day they decided that everyone else had one so they went and got one too or because someone told them that it was a must to have a website if one wanted to grow their business. So they went and got a web designer or an ad agency or a nephew or niece to make a website for them. Now they don't know what to do with it and most lament - "Oh I have a website but it hasn't really helped me in any way." Yes there are a lot of useful, interactive websites in India today that have helped and are helping the businesses grow, however what I am talking of here is the numerous many who have built a static website in the past or those who are wanting to built one and believe me the number of such businesses is way way higher than this who have functional useful websites. First define the purpose - keep it simple and narrow it down to one or two or maximum three basic functional purposes that can be defined and measured. e.g Do you want to sell products to consumers? Or do you want other companies to hire your services? Or do you want to attract talent? etc etc..
Then based on the purpose define the target audience for the website - who are you building it for. e.g Your dealers? Consumers? Investors? Potential employees? Potential Investors etc. Narrow the list down to the key audiences for the key purpose or purposes. Once you know what you want, for whom & why, then it's fairly simpler to decide how to go about finding the right team or service provider to start the process. Have someone with in-depth knowledge of your business and target audience drive the process of making the website. Make sure they also have authority and reach within the organisation to act as a bridge between the people who run the various aspect of the business and the team that will build the website. It's very rare to meet someone who wants to build a website and knows precisely what they want from it. But those who do are the ones who really benefit from it. According to a study titled ‘Indian Footwear Industry: An Analysis’ released by The Associated Chambers of Commerce and Industry of India (ASSOCHAM), the Indian footwear industry is currently pegged at Rs 22,000 crore and online shoe shopping currently accounts for about eight per cent of the overall industry. This roughly stands at Rs 1,760 crore. According to the August 2011 report “The Checkout International: Indian Shoppers” from The Integer Group, a retail branding agency with offices worldwide, 42% of consumers in urban India had purchased travel-related tickets online, while another 33% would consider doing so in the future. eMarketer estimates that the number of online buyers in India will reach 21.5 million in 2012, driving $14.2 billion in business-to-consumer (B2C) eCommerce sales, including travel, for the year. Retail eCommerce, which excludes travel, will reach $2.4 billion. Travel will continue to account for the majority of online sales through 2015, but as online retailers improve services and selection, online buyers will look to the web for a wider variety of products and better prices. The eshops are there, so are the window shoppers and the buyers. They are coming not only from the Metros and mini metros but also from smaller towns and cities. Some of these ventures are self funded -till now, and some are VC backed. What they all need now are more customers - of the buying kind, to expand sales, increase product portfolio and make some real money (not only valuations). So why is this all taking time? And how much time will it take to see some of these ventures get handsome returns and make genuine long term profits? How do we increase sales and grow the business? While external factors such as the state of the country's economy, inflation, Rupee value vis a vis the Dollar, etc etc... will effect these businesses like they do to all businesses, for the ecommerce / eRetail ventures there is only one way to go for quite some time to come and that's up and up. Look at US and Europe and while retail sales are growing marginally what is still growing is eRetail. And that's bound to happen as in tough time people are looking to make smarter buying choices and nothing better than the Internet for that. Not only are things cheaper on eRetail (due to reduced expenditure on Middle men and shop floor rentals and manpower etc etc) there is also a better choice of products & vendors to choose from. In India we are just starting to experience the benefits of eRetail, both buyers and sellers that is. 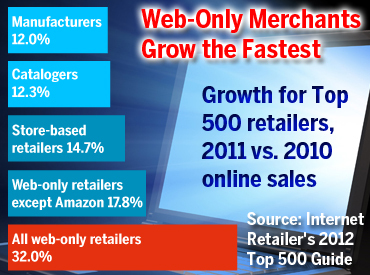 So we have a long way to go but how fast we can grow the eRetail business depends a lot on us. What do we need to do? Well from my experience of over 23 years,the last 15 or so of these being in the Internet space, there is one things that's most important that people and organisations tend to forget to focus on. And that is - The Customer. Define what business we are in - We may be selling Clothes or shoes or discount coupons but if that is what we think we are then growth will be slow and painful. We have to be in the business of fulfilling a need for our customer. Define who are our customers - It is better to sell to a targeted audience that has a need rather than everybody and anybody as then you will burn a lot of money to get some people to buy rather than target a select few and get them to buy at a lesser cost. Be where our customers are. Find out where our target audience is and then make sure we are there too. Communicate benefits - For the target audience, the Customer, instead of shouting product or service benefits to one and all. What is in it for him or her? How will our product or service solve their problem or fulfill their desire? So like I said before - The focus here has to be only on the one and most important entity - The Customer. All the above are nothing new. We all know it. We learnt this in business school, read books written by experts and read articles on this every day. However each one of us, when we sit at our desks every day, what we concentrate on, is doing our tasks or our job. That's it. Over the years we have been taught to do what we are told to do. Our job. A designer is busy preparing the best design, a marketing executive is busy trying to make an award winning marketing campaign, a programmer is busy writing code to make things work, the finance person is busy saving money for the company, an HR executive is busy managing hiring and employee retaining strategies, the CRM executive is busy clocking hours and getting rid of customer queries in the shortest possible time with the best ratings and a CEO is busy managing teams in-house and externally to keep the business growing for the investors. So who is looking after the customer??? Mostly Its No One. The programmer says - Hey the Product person tells me what features and functionalities they want and I make it. Don't look at me. The HR woman says - Hey the Management and the Employees are my customers and I am taking care of them. The marketing person says - Oh I am all about the customers that is why I just did a Market research and am creating a fundoo campaign to get more click through's and page views, the CRM person says - Am listening to customers all the time and resolving their queries, what more do you want me to do? However frankly, what is happening here is that no one is really looking after the customer from the time he or she has a need to after they have or have not bought from you. In piece meal - yes someone from the company is actually looking at or thinking of the customer at some point in time but on the whole - No one. But then that's true for all businesses - aren't we talking of e Retail here? Well we are. In the Internet & New Media space this - Customer focus becomes even more important than anywhere else. And that's because here all the 4P's of marketing are the medium itself or a part of the medium. Here we can track, measure, interact at every step, here we can correct on the go, here we can change strategy on the fly, here we can test and then apply, and most importantly here the customer needs us much more than in the physical store front. S/he has no face to see, turn to or trust. They come by their choice, for their need and the need to make a decision for themselves. If we are not attentive or don't make it easy and intuitive for them ... well they will go... and Buy from someone else. The marketing person concentrate on creating campaigns that will drive the right kind of customers to the website because they will know who their target audience is and create a campaign that will not only drive traffic but also lead to sales. The Product, engineering and design team make customer friendly and intuitive websites that will help a customer find the product and buy it in the shortest possible time. The CRM team will make the buying process simpler and also encourage repeat buying by hand holding a customer or a potential customer and help them buy instead of just solve queries. The finance team will make the payment and billing and refunds etc so simple and hassle free that every customer will want to come back the next time again. And same for everyone else in the organisation. Ideal Situation and hence impossible to do some will say. Well sounds ideal but not too difficult to do actually. Is it so difficult to inculcate a culture of customer centric approach? Is it difficult to share statistics and data with all teams and show them how what each one of them did impacted the customer experience. A better design leading to faster load times or easy navigability leading to increased page views, a simpler checkout, a faster returns process or refund and how it all impacted sales and businesses?? ?